Small spaces are making a big impact on home design. With trends like tiny houses and minimalism, everyone is looking to declutter and make the most of the small spaces. Little rooms can still fit all of your day-to-day needs while feeling spacious and uncluttered. Use these simple tricks to maximize your space. “With tiny homes and personal declutter trends taking the world by storm, many people are learning to do more with less.” -Zillow Torchlight Read the article HERE. ‘The right paint color has a huge impact on the overall feel of a room. 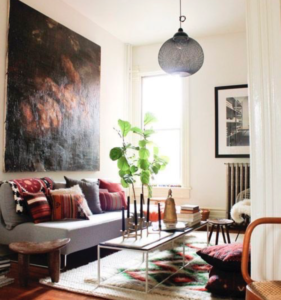 Light, neutral colors will make it feel more expansive. They’ll also give your space a clean feel and make it seem brighter. If you want to emphasize rather than hide your space’s smallness, consider a dark color. 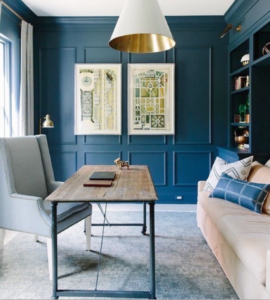 Navy or charcoal will accentuate a small room’s den-like coziness. It’s easy to keep clutter out of sight with innovative storage. Beds with storage spaces underneath, roll-away kitchen islands, and coffee tables with built-in shelving underneath will reduce a cluttered, overpacked look in a small room. Consider shelving that goes higher up than you’re used to. In a small room, vertical space is invaluable. Being able to decorate or store necessities higher up will open your floor space, making it feel more spacious. Just because your space is small doesn’t mean you don’t get to decorate. Think of hanging things that help make your space look bigger, like paintings with receding colors (like blue). Also, large mirrors can give a small room the illusion of being bigger. Harrison Luxury Group is your partner in Southern California Luxury Real Estate. We offer extensive experience and knowledge in the luxury market. If you need help with Agora Hills Real Estate, Malibu Real Estate, Westlake Village Real Estate, or Calabasas Real Estate contact us today by calling 805-208-7544 or emailing us at sales@SoCalLuxuryRealEstate.com.